Congratulations to Bernadette Hopen, Azure Qian Yu, Teresa Engebretson, and Asami Tanimoto, who each won five coupons good for one free pint of Ben & Jerry’s! The contest was part of Net Impact’s 2018 conference, where 2000 sustainability-minded students gathered in in Phoenix, Arizona for two inspiring days of speakers and networking. 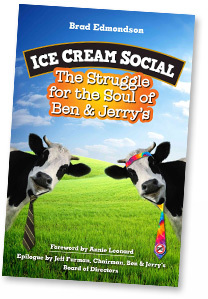 Berrett Koehler, publisher of Ice Cream Social, donated 1,000 copies of the book to give away to attendees. So even if you didn’t win the ice cream, please enjoy the book!